It’s time for another Switch re-release of a game that has been released time and time again. 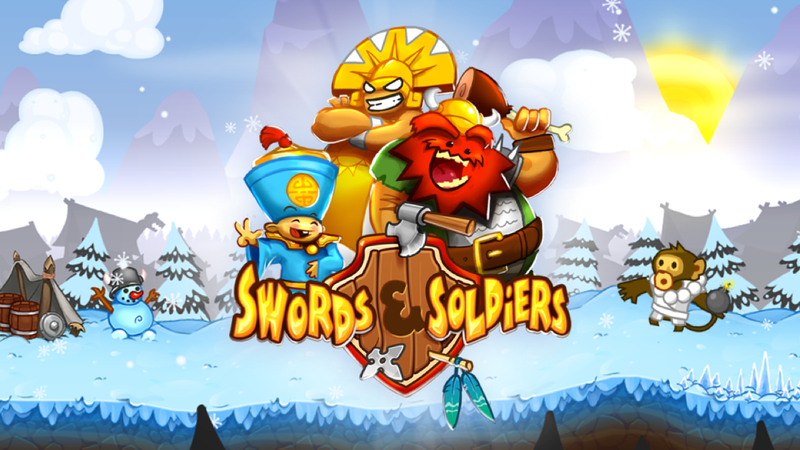 This time it’s Swords & Soldiers – a popular RTS title that originally came out ten years ago. However, I’d never played this before, so rather than compare it to versions that have gone before, this is a review from someone with fresh eyes about the whole thing. You start with a set amount of gold and mana, and then you proceed to play the level by figuring out how best to spend it all. The characters available to buy at the start are basic – just a basic gold miner and a warrior character, and then as time goes on, you unlock more and more characters. But it’s not just characters, you also get to unlock some amazingly godly powers such as the healing ray, the rage attack, or my favourite – the lightning attack. You don’t take individual control of your soldiers at any point, instead just pointing them towards their objective and making sure they have enough upgrades, allies and powers to ensure that they can win. And it’s a lot of fun. The simplistic cartoon style matches perfectly with the game’s sense of humour, and after you’ve finished playing with the Vikings, you get to try out the other stories – with the Aztecs, the Chinese and the Chief Meat storyline all opening up to give you loads of playability. And by and large, it’s a good game – although it does get a bit repetitive long before you’ve run out of levels. It’s not a particularly hard game, and in general if you fail you re-try with a better idea of how to proceed, but the repetitive nature of the short levels can mean that it’s a game best enjoyed in short bursts – I normally sink hours at a time into games, but this one was much more fun if I played for about half an hour, left it for a bit, and then came back to it.